A revenant plagues the mind of a composer who’s renting an old, decrepit house. 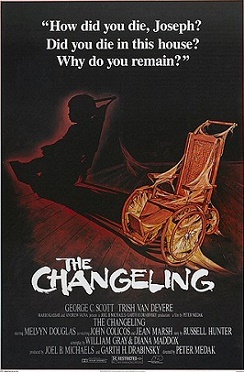 The Changeling is sorta similar to The Uninvited (1944) insofar as there’s a musician occupying a sprawling house, which turns out to be haunted. 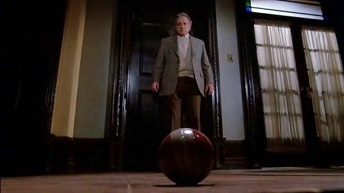 The key difference is that in this one, Mr. Russell (George C Scott) is only a tenant not an owner. There’s some consolation. Hate to lose a big investment. Russell loses his wife and daughter in a horrific winter crash in Upstate New York. He moves to Washington State, and eventually resumes life teaching music in the local university, and sets up shop in a house that’s vacant, and which requires involvement from the local historical society (can’t stress this enough: this is NEVER a good sign). Every dilapidated mansion needs a caretaker, and the lone Mr. Tuttle provides the blue-collar counterpoint to the overly mannered Russell, at one point apologizing for “interrupting his composin’,” as Russell’s performing Mozart’s Rondo in A to an empty, echoing abode (please see our Scary Classical Music Pieces list). Shortly thereafter, the piano comes to life striking a lone key when he steps away from the ivories. The Changeling takes forever to draw in the viewer, but there are enough little enticement gems, especially how the camera lingers on Russell’s back, like it’s eavesdropping. And the clanging Pavlovian bell soundtrack, interspersed with a highly effective (though now overused) children’s choir, really adds to the sense of dread. Convinced that he’s not alone, Russell digs into the home’s dark backstory, teaming up with the real estate agent, Claire, who hooked him up with his accommodations. They find out a child died around the turn of the century, a boy, Joseph, linked to a high-powered politico. Russell also enlists the help of a spirit medium to contact the Great Beyond. When the clairvoyant’s made a connection, her feverish message scribbling is a highlight. And we find out more about the restless spirit and how it ties into the present. But it’s Joseph’s drowning that made this movie famous, along with the recurring bouncy ball motif, a toy belonging to Russell’s dead daughter, which is a bridge between the father and the house apparition. The Changeling has not diminished in its capacity to instill horror. This entry was posted in Horror and tagged 80s horror movies, horror movie deaths, movies and music by Really Awful Movies. Bookmark the permalink.